If you launched a boat at the New England coast this summer, chances are you navigated through brilliant green strands of grass that hug the shoreline. Our local seagrass, Zostera marina, also called eelgrass, and there is something soothing about the sway of these grasses right below the surface of the water. 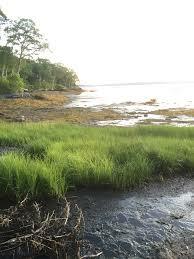 At low tide, the grasses stand up tall, starkly green against the dark mudflats. We acknowledge them, (or maybe pay them no real notice at all), but these strands that are seemingly in our way are very important to the success of our shoreline and ocean. According to the Smithsonian, seagrass, “one of the most productive ecosystems in the world,” evolved around 100 million years ago. But like so many ocean assets, we are losing seagrass daily. Pollution from fertilizer, sewage, urban runoff, sedimentation, storms, and rising ocean temperatures pose threats to seagrasses. When we loose seagrass, habitat for the creatures that depend on it such as crab, quahog, and scallop is also threatened. Seagrass, a primary producer of oxygen with its leaves, stem, and root system, works its magic by becoming an underwater meadow, feeding and harboring sea creatures, filtering toxins by absorbing nutrients and all the while protecting our coastline from erosion. New studies suggest that the amazing seagrass may also play an important role in mitigating the effects of climate change. By grabbing carbon dioxide from the atmosphere to use in photosynthesis, carbon is transferred to the soil as plants die and decompose. In this recent study from MIT’s Sea Grant, Massachusetts eel grass was found to store carbon from outside sources, confirming that we need healthy seagrass for a healthy ocean and healthy planet.